Undetectable hair replacement systems for all ages. Styled by the top professionals in the industry. 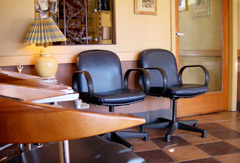 Come in for a FREE Consultation and get all of the facts on hair replacement. Our private rooms provide a relaxing atmosphere to evaluate your options. We will help you make a decision that you are comfortable with. Products designed and manufactured by award winning stylist Thomas Ortiz. Consistently delivering top quality work and surpassing the competition.